Founded in Abilene, Texas in 1975, Rogar International is now stationed in Petersburg, Virginia where the goal remains to design, manufacture and market top quality products. By focusing on fine craftsmanship, unique products and high quality material, Rogar has become an industry leader in manufacturing Hanging Pot Racks, Wall-Mounted Pot Racks and other fine products. This All in One Wall Mounted Potrack with Shelf lets you store all of your cooking need in 1 place. Hang Pots and Pans and Strainers and Utensils and store your Spices and Measuring Cups on the shelf. 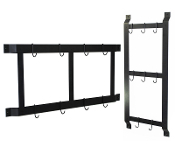 The Rogar 12" Wall Mount Bar Racks are the ideal addition to any kitchen. These Rogar pots racks are big enough for all your kitchen utensils to fit nicely where you need them most. Choose from up to three different finish color options. 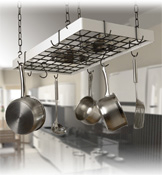 The Rogar 35in Hanging Rectangle Pot Rack is long and slender to maximize storage space in smaller kitchens. Rogar pot racks are both functional and stylish with three finishes and accessory color options that show off a great cookware set. 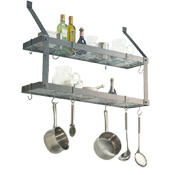 The Rogar Hanging 36” Bar Pot Rack is a long and slender bar used to maximize storage space in smaller kitchens. Rogar pot racks are both functional and stylish with five finishes and accessory color options that show off a great cookware set. 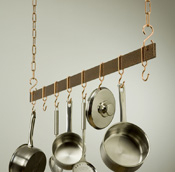 The Rogar Hanging 42” Bar Pot Rack is a long and slender bar used to free up your kitchen cabinets. Rogar pot racks are both functional and stylish with five finishes and accessory color options that show off a great cookware set. 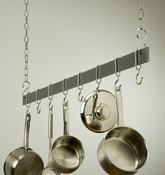 The Rogar Hanging 48” Bar Pot Rack is a long and slender bar to hang all your pots and pans on. Rogar pot racks are both functional and stylish with five finishes and accessory color options that show off a great cookware set. The Rogar KD Half Dome Pot Racks with grid adds a three dimensional element to your kitchen. These Rogar pots racks are perfect for clearing out your cluttered kitchen cabinets. Choose from up to ten different accessory color options Using the Rogar KD Rectangle Pot Racks with Grid is a unique and stylish way to store your pots and pans. Rogar pot racks are ideal for kitchens in need of extra storage space. Select from nine rectangle pot rack finish and accessory options. The Rogar KD Rectangle Wooden Pot Racks with Grid uses a stained Ash Wood with metal corners that complement the wood finish. 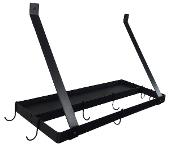 This Rogar pot rack will match any kitchen with nine rectangle pot rack finish and accessory options available. The Rogar Gourmet Oval Pot Racks with Grid are among the most useful tools in the kitchen. 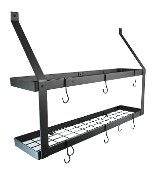 Rogar pot racks are designed to suit any need by providing easy and convenient storage. Select from 13 oval pot rack finish and accessory color options. The Rogar Medium Oval Pot Racks with Grid provides a sturdy storage space for all your pots, pans and utensils. Rogar pot racks are both functional and stylish with five finishes and accessory color options that show off a great cookware set. The Rogar Large Oval Pot Racks with Grid is for larger kitchens with more pots and pans than the average chef. Rogar pot racks are both functional and stylish with four finishes and accessory color options that show off a great cookware set. The Rogar Oval Pot Racks with Centerbar enhances both sturdiness and functionality in the pot rack. Rogar pot racks show off a great set of cookware freeing up precious cabinet space. Select from five oval pot rack finish and accessory options The Rogar Rectangle Pot Racks with Centerbar enhances both sturdiness and functionality in the pot rack. Rogar pot racks are ideal for kitchens in need of extra storage space. Select from five rectangle pot rack finish and accessory options. The Rogar Rectangle Pot Racks without Grid is simple yet functional while matching any decor. Rogar pot racks are ideal for kitchens in need of extra storage space. Select from five rectangle pot rack finish and accessory options. Thank you for browsing through our Rogar Pot Racks section.